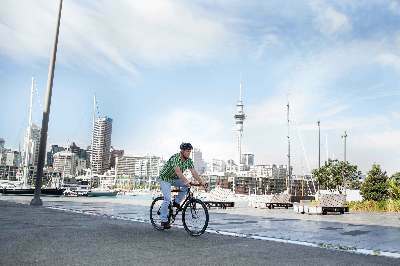 LOVE OF CYCLING FITS IN NICELY WITH property investor and Auckland Property Investors’ Association (APIA) president Andrew Bruce’s inner city lifestyle. Bruce, who works from home, doesn’t just use a bike to get from A to B – he often arrives at inner-city meetings on one. The significant property portfolio he owns with partner Cath Heppelthwaite is a balance of cashflow and capital gain properties including central Auckland houses, CBD apartments, a motel and a block of units in Hamilton and a property in Rotorua. Andrew is drawn to apartments not just because he lives in one, but because high tenant appeal and returns make them attractive investments. Cycling has played a key role in Bruce's property journey, including as a stress reliever in 2012 when he was largely selffinancing a motel build. During a long bike ride in 2004, he decided to become seriously involved in property investing, to treat it as a business. He had just completed an Ironman New Zealand and was eyeing a new challenge. Investing in property made sense. Property was not only tangible (especially important when he had seen clients of his accountant father, Ron, lose everything in shares in the stock market crash of 1987) but it was also an investment to which value could be added. He saw rental income from property eventually funding the lifestyle he wanted based around travel and sport. From the beginning he knew the benefits of property investing would take time, so he and Heppelthwaite set a goal of an adventure holiday each year to help keep them on track. Nepal, South East Asia, Europe and Sri Lanka are among places they have travelled to, which included a 1200km cycle trip over 16 days to 5000 metres altitude to Everest Base Camp. Travel to Japan and Indonesia is planned for later this year. Bruce grew up in Christchurch with sport, mainly tennis, the centre of his life. He studied valuation after high school before heading to Germany to coach and play tennis for 18 months. In 1988 he and Ron were part of the Australasian team to win the father-andson world tennis championship Kiam Cup in Spain. The duo also represented New Zealand in Florida in father-and-son tennis in 1990. On his return from Germany he moved to Auckland and found a job with Valuation NZ (now Quotable Value NZ) before taking a project manager role with a private development company. It didn’t take Bruce long to know that he didn’t want to work long hours to line someone else’s pocket. A move to Auckland City Council gave him a 40-hour a week job where he could fine tune his skills. He worked on many significant projects including the Parnell Baths and the Auckland’s downtown carpark. While Bruce had been previously involved in a small residential investment in Christchurch, his first property purchase in Auckland was in 1996. He’d been given advice to buy central and close to the motorway. The pair drew a circle on a map of central Auckland ruling out areas like Ponsonby and Herne Bay as too expensive. Going halves with a mate he bought a three-bedroom house on Haslett St in Eden Terrance for $230,000. Three years later Heppelthwaite bought the friend out and the couple undertook re-piling and re-wiring, painting and landscaping. To find out about more about Bruce's next step into property investment and his portfolio spanning Auckland, Hamilton and Rotorua, click here to get the digital issue.